According to Georgian legend, God took a supper break while creating the world. He became so involved with his meal that he inadvertently tripped over the high peaks of the Caucasus, spilling his food onto the land below. The land blessed by heaven's table scraps became Georgia. Nestled in the Caucasus mountain range between the Black and Caspian seas, the Republic of Georgia is as beautiful as it is bountiful. The unique geography of the land, which includes both alpine and subtropical zones, has created an enviable culinary tradition. 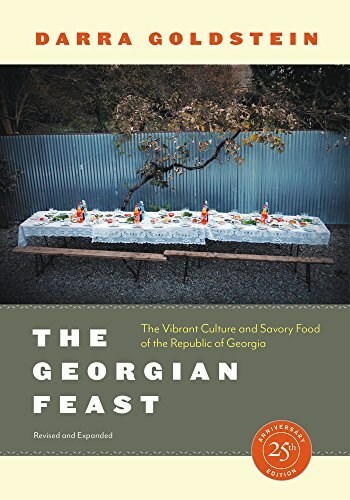 Winner of the IACP Julia Child Award for Cookbook of the Year, The Georgian Feast introduced a generation of cooks to the rich and robust cuisine and culture of Georgia. This revised and expanded anniversary edition features new photography, recipes, and an essay from celebrated wine writer Alice Feiring.